Would you go months without brushing your teeth? Or years without visiting a dentist? Cupertino Animal Hospital now provides our patients with both traditional Professional Pet Dental Cleaning and Anesthesia-Free Dental Cleaning. Anesthesia-free dental cleaning for dogs and cats is a great option to keep your pet healthy without the risk of anesthesia. With anesthesia-free dental, more frequent cleanings can be done on a routine basis in order to promote quality health for your pet. Because anesthesia-free dental procedure is done without the use of anesthesia or pre-anesthetic drugs, it is safer for your pet's health, and the cost of the procedure is significantly lower. 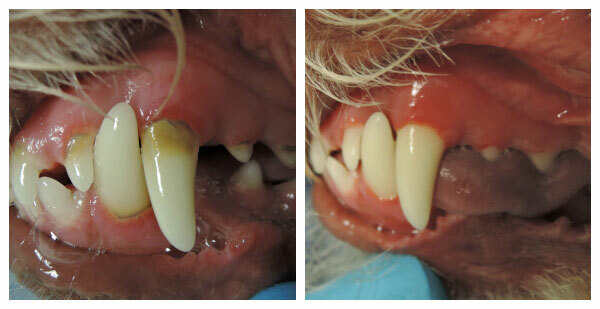 Photos taken by Cupertino Animal Hospital before and after Anesthesia-Free dental cleaning. While anesthesia-free dental cleaning has many advantages, not all pets are good subjects for non-anesthetic procedures. Examples of pets who would not qualify for this procedure would be any pet who presents with severe arthritis, requires X-rays or extractions, is easily stressed, and/or cardiac and respiratory problems*. Likewise, a patient with aggressive behavior would not be a good candidate for this drug-free procedure. Sometimes, our technicians are able to calm a fearful pet enough to allow for a full cleaning. In the cases where this does not apply, the technician/veterinarian would alert the owner immediately to recommend an alternative treatment approach. *Each pet is an individual and their specific conditions vary in severity. Your pet will be examined by the veterinarian and the procedure will be monitored closely by the veterinarian to ensure quality treatment and experience for your pet.